Stuck for Gift Ideas for Dad this year? Settlers Run Golf & Country Club is here to help! Please see some of our gift ideas for Dad this Fathers Day. 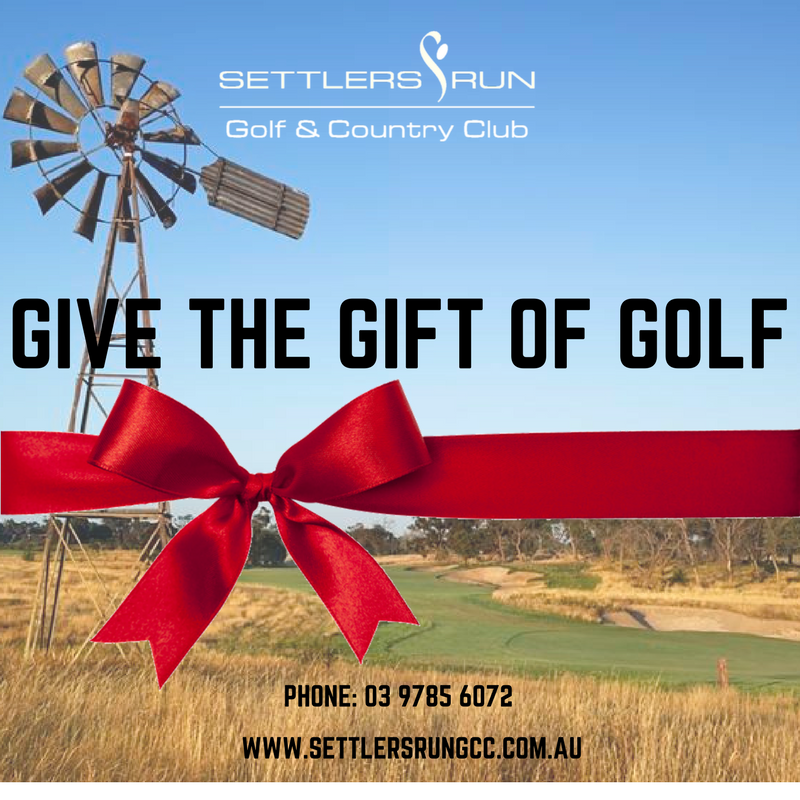 Gift the gift of golf! Our golf course offers an adequate challenge to any golfer with the championship length and design. While remaining playable to the average golfer with generous fairways. The 18 hole design of Settlers Run takes advantage of the smooth landscape and natural wetlands to create a layout that fits seamlessly with the surrounding environment. Spoil Dad with a Golf Membership! A Membership at Settlers Run Golf & Country Club is more than just a Golf Membership. Dad will be able to play on one of Australia’s best golf courses over and over again! He can explore the large fairways, avoid the bunkers and take on the fast greens. Every round will be a new and unique experience that will be sure to satisfy the beginner golfer through to the advanced professional. He will also gain access to our country club facilities that include a 25m swimming pool, fully-equipped gym, sauna, spa If you’re Dad is considering joining a golf course, you can’t go past a golf membership at Settlers Run. We offer an onsite golf shop that includes a comprehensive selection of the latest equipment, apparel and accessories from all the major golf brands. The shop staff are also qualified PGA Professionals and Trainee Professionals, ensuring their knowledge of the game and golfing market is up to date and capable of helping you with all of your golfing needs. Our PGA Professional , Scott has worked in the golf industry for over 10 years, playing through the amateur ranks and now in Professional events throughout Australasia. His determination and drive for the game saw him turn professional when he was 22 years of age. As much as Scott loves playing the game he is passionate about coaching and helping others achieve their golfing goals. Scott’s experience and vast knowledge of the golf swing over the years have brought him to where he is today, coaching to golfers of all levels and abilities. Give the gift of food! Your can purchase a voucher from the VUE Restaurant to your nominated amount. Your Dad will be able to enjoy a meal in our 10 million dollar designed Golf & Country Club. Situated in Botanic Ridge (Formerly known as Cranbourne South) in a private members estate. Our a la carte menu caters for small and large servings and also can be suitable for sharing. With lunch and dinner specials on offer our menu can offer an affordable fine dining opportunity. Still can’t decide? 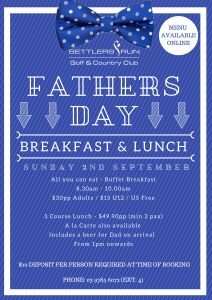 Then bring Dad down on Father’s Day for our Buffet Breakfast or A la carte Lunch! Click the picture below for BOOKINGS!